I have had my iPad for a couple of months now, and the device is never far from me. It really is the ultimate casual media consumption device for me, and nicely fills a niche that was previously being fulfilled by my iPhone: ubiquitous and instant access to information. I have even on a few occasions brought the device to work with me, and it has proved extremely useful to access information on my internal work network when in meetings or a coworkers office (tightvnc running on my main machine allows me to quickly and easily remote in to get at other information). The problem is that I do not have a case yet that I like. I tend to really enjoy the industrial design of Apples products overall, and often do not care to muck about with them by ensconcing them in cases of questionable quality (either build or style). With my iPhone it wasn’t really a question. I have always used each of my iPhones entirely without any case. Given the quality of the glass used on the touchscreen, the only part of the phone that I had ever been concerned about was the back and bezel (in the time I have owned my 3G since launch day, I have only really managed to put a couple of small scratches on it from an unfortunate sailing trip). Holding this fabulous slab of glass and aluminum makes me think a little differently, though. My iPhone usually has the benefit of being housed in a pants pocket, and at least has some protection from the vagaries of the world. My poor iPad, on the other hand, finds itself exposed to all manner of undesirable things when I bring it along places (oh, the guilt of first-world problems!). 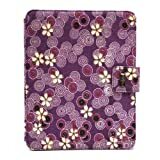 So the search was on for an iPad case that would fulfill my use patterns, and look good doing it. I want to access and use the device while it’s in the case. This means that I am not interested in a bag or pouch. I want something that looks good. The iPad by itself is a wonderfully slick looking piece of hardware. If I am going to be putting it into a case, I want that case to reflect good design. Access to all of the ports and switches. No need for storing extra things in the case. I am not interested in decidedly kludgy looking methods for securing my iPad in the case. If there are four elastic straps over the corners holding my device in place, I’ll pass. Those requirements led me to some lively conversations with my little sister, Cindy, about what would be a good case for me. At the time, I had looked around enough and found what I felt was a great fit for me in the Dodocase, but the wait times were approaching 10 weeks to get one. 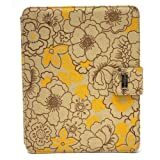 I went ahead and put the Dodocase on order. It was many weeks later that I was lamenting the fact that I still hadn’t received my case when my sister innocuously sent me a link to the JAVOedge Fiber Axis Case. I couldn’t pass up a chance to rib her for not getting me the case that her company makes. I even offered to write up a review of the case, and she finally succeeded in getting me an editorial copy to investigate. After spending a couple of weeks with it, here is what I have found. This is by far the coolest and most useful feature of this case, and is almost worth the price of admission alone. There are many other cases on the market that will support the ability to prop the iPad up in some fashion, but where the JAVOedge case really sets itself apart is in the ability to rotate the orientation of the iPad when propping it up. 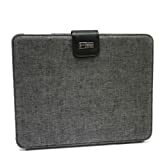 It does this by incorporating an incredibly useful swivel for the cover of the case, which has rubber stoppers sewn into it that will catch the edge of the ipad for propping at different angles. This is a fantastic feature, and should push the JAVOedge case to the top of anyones list if they need the ability to prop the iPad up in either orientation, and at varying angles. The build quality of the case is fantastic. 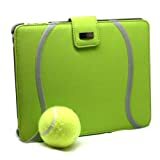 This case is basically a modified version of their “Back Cover” which is composed of a polycarbonate plastic shell that sort of clips onto the back of the iPad. To this shell, JAVOedge added the swivel front flap cover that serves double duty as the base of the stand when propping up the iPad. The swivel quality feels very sturdy and not flimsy at all. It has just the right amount of resistance to swiveling that makes it feel substantial and not cheap. 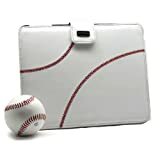 The outer material of the case is available in many different finishes (baseball, basketball, charcoal, cherry blossom, fiber - what my review unit has, plaid, poppy, and tennis as of this writing) that are all synthetic and animal friendly (really)! The lineup of JAVOedge Axis case styles. The interior of the cover is a nice quality microfiber material, and the stitching and assembly are all high quality (no unfinished ends or strange fittings) and nicely finished. The rubber stops that make up the propping mechanism on the inside of the front cover feel quite solid, and are also fully stitched into the cover (with recessed stitching to help protect the iPad screen from touching anything more than just the rubber itself - another nice touch). One minor thing my wife pointed out to me was that the rubber stops do tend to smudge the surface of the iPad, but these are not normally noticeable when in use. The cover material is slightly plush with a little bit of give, and the back cover feels quite solid to the touch. This give the case a nice feel in your hand when carrying it: substantial, but soft. Overall I felt that my iPad was very nicely protected in this case, and did not worry about normal use tossing it around. The magnteic latch was also nicely appointed, and the magnet does a great job holding the cover closed. There is a nice JAVOedge metallic button on the latch that really finishes off the overall look of the case. The back cover that holds the iPad in place has all of the ports and switches cutout to allow access to everything on the iPad, while making sure that any areas with no buttons or ports are fully covered. This is a really important detail I feel, and one of the main reasons that I was interested in this case. No need to do anything special to access all of the buttons and ports, which means I could have my headphones plugged in and adjust the volume without ever having to open the case to do it. I also feel that just the back cover would be a fantastic option for those who are willing to forego some protection for ease of use. One of the nicest things about this case design is that when in use, the case just “gets out of the way”. 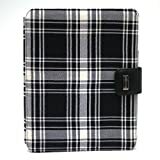 Due to the method of slipping the iPad into the plastic back case, there is nothing obstructing the front of the iPad. I simply cannot stress how nice this is, and what really sets these types of cases head and shoulders above other options. 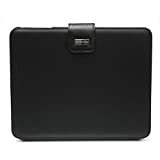 JAVOedge also sells just the plastic back cover as a separate product, and would be quite worth it on it’s own (if you didn’t want a front cover or to use the case as a stand). For all the things that are done right, there are unfortunately a few glaring oddities that I would be remiss in not pointing out. The magnetic latch is one. The latch is attached to the plastic back cover, and when the cover is closed on the case, the latch will flop over and magnetically catch on the front cover. The problem is that when the iPad is in use, the latch will still want to flop over. Flop over and obscure the iPad screen. This is especially irritating when using the case as a stand in landscape mode, and maddening when using the iPad while holding it. It would have made a lot more design sense to switch the orientation of the latch so that it was actually connected to the front of the case, and would wrap around and magnetically catch on the back instead (though I am not sure if a magnet that close to the iPad itself would cause other problems). Aesthetically I can understand the decision, but perhaps engineering some method for holding the latch back out of the way easily would have gone a long way to help. The rubber stops that allow you to prop the case up at various angles seem to be a tad bit bulky for my tastes. They also tend to smudge the screen a bit when the case is closed. This is a small item, and nearly insignificant as far as I am concerned. The other problem is that even though the swivel is a fantastic option that really sets this case apart, you do lose some of the stability when trying to use the iPad lying flat. The swivel mechanism causes the surface to wobble unsteadily on the swivel, and makes typing very burdensome. Though this can be lessened by using the iPad in one of the propped up modes, for flat desk typing (as I am sometimes doing) it is just too unstable to be used reasonably well. I should point out that this only affects use of the iPad in the case on a flat surface such as a desk or table. When using the iPad on my lap with this case, for instance, there was no problem whatsoever. Indeed it was quite comfortable to use this way, where the swivel mechanism would actually be centered in my lap, and my legs would be stabilizing the iPad to the sides. Overall, this is a case I would wholeheartedly recommend to any of my friends who were looking for the same features I covered. 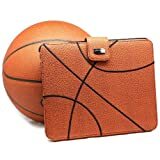 Right away I can definitely say this is a better value than the stock apple iPad case, hands down (and the same price, $39.95 USD, to boot!). Are there a few things that I am not a fan of? Yes. Pair it with a Think Outside Stowaway bluetooth keyboard (snagged on ebay for about 50 bucks), and this is an absolutely killer combination! (I may review this killer keyboard in the future).